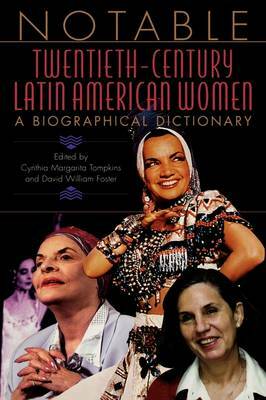 Notable Twentieth-Century Latin American Women is a powerful testimony to the outstanding contributions 72 of the most noteworthy women have made to their fields and to society. This volume covers a broad range of women excelling in the fields of politics, art, religion, government, education, literature, popular culture, and the sciences, with substantial, up-to-date biographical and career overviews. Many notables are international figures, such as former Nicaraguan President Violeta Barrios de Chamorro, Cuban Queen of Salsa Celia Cruz, and Mexican artist Frida Kahlo. Others, such as the Mirabal sisters, founders of a resistance movement against a repressive Dominican Republic regime, and Carmen Naranjo, a prolific Costa Rican author and champion of culture, merit the wider recognition offered here. An excellent introduction detailing the status of Latin American women in the twentieth century is the ideal framework for appreciating the struggles of these women. In the entries, information given includes family and background details, education, influences, obstacles faced and overcome, and achievements. Each entry includes a Further Reading section to enable students and other interested readers to learn more about the woman's life. Numerous photos enhance the text.